Use self-authentic-leadership to drive your self-patience to predominantly exercise yourself within yourself authentic tastes, touches, feelings, views and visions. How do you mobilise yourself to achieve? You pick and choose from your personal-qualities chart those qualities that are related to your self-patience. You do each one of the personal qualities you have chosen. Initially, you will do this on a one after the other basis, but as you gain momentum in doing those personal qualities you begin to do them together. This ability grows out of your doing each personal quality individually naturally. You do not have to force matters, just flow in the personal qualities as they come at, after you have bootstrapped your self-authentic-leadership process. This is the art of self-patience. In the process of driving your self-authentic-leadership you will move from being a self-authentic-leader in yourself to being a self-authentic-leader for yourself. Consciousness of self-authentic-leadership lights up in you when the three components of your person connect in the sequence spirit-soul-body. This is when your spirit-soul-body portal is connected end-to-end and you as the owner of that portal can see and say you know that you know that you are now a self-authentic-leader. Theory in realising higher values such as personal qualities only work as far as you can talk. You reach a point when your authentic practice must kick in. Just like you pass through physical body pains (and take measures to recover from body pains) you will also pass through the chasm of pains from self-authentic-leadership in yourself to self-authentic-leadership for yourself. So how do you pass through the pains from self-authentic-leadership in yourself to self-authentic-leadership for yourself? You ensure that you are aware of, engaged to, based inside, oriented to and by, and driven from, through, and to self-patience. Be patient with, in, by, through, to, and for yourself. The biggest challenge we all have is to focus on doing you. 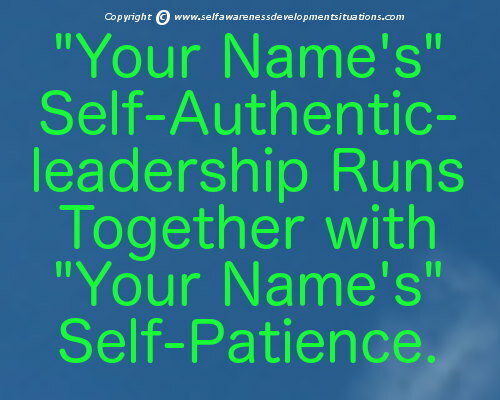 Use self-patience to drive through your self-authentic-leadership for your own benefit. The rest, and you should mean it. The rest, as they say, will be history! Then I discovered a question for myself. Why don't I develop my own products? I guess that was the best thing I learnt from my MBA studies. Of course the MBA instigated this behaviour in me. My MBA thesis supplied the business concept and material. Now I needed to get down to productivity. After a long research for the best in class tools for personal application, I found SBI. Initially I was sceptical, but as I explored the SBI process, the tools and the core SBI support team including the more than 380 business sites that are running on top of SBI, I realised I was home and dry. I hope you can enjoy as i am doing, slowly, step by step, just like the tortoise! Its a copycat cyclical game. You read, you check out some examples, you experiment on your own site and your release that part of your product and monitor it's performance. Have you ever had that warm and fuzzy feeling when you open your emails one morning or afternoon and you find that a fellow active verbalize-your-action reader has actually taken the time to tell you how much she appreciates your hard work? Its totally something magnificent. You cannot put works to this level of appreciation. However, that is the fuel that keep us going, mining for the best verbalize-your-action pearls we can find so that we can continue to encourage our readers to keep expanding your awareness. After all we all are in this human journey together and the more of us become aware of how to deal with situations the better our world gets!